In 1523 fourteen-year-old John moved to Paris to study for the priesthood. Education was in transition in Europe due to the Renaissance stress on studying the works of antiquity with a particular emphasis on the Greeks and Romans. Included among ancient writings is God’s revealed will in the Bible; the Renaissance emphasis on getting to the sources provided the interpretive tools to study Scripture in its original Greek and Hebrew. In Paris, the writings of Martin Luther were influencing students with some adopting his views, but officially, his works were banned. One follower of Luther, Jean Vallière, was burned at the stake in Paris not long before young Calvin arrived. When the Renaissance method of appealing to the sources was applied to sola Scriptura by reformers, it faced opposition because all things theological were controlled by the papacy. Thus, the educational environment regarding theological subjects was tense when Calvin began his studies in Paris. He started in the Collège de la Marche but in short order moved to the more respected Collège de Montaigu where he completed both his bachelor’s and master’s degrees by 1528. He was progressing well along the educational track for becoming a priest until his father changed his mind regarding John’s future. Gérard had decided that the prospects for his son making a good income were greater in the practice of law than in the priesthood, so Calvin was redirected by his father to the study of law. Calvin moved about eighty miles south of Paris to Orleans for his law program, but when his father died in 1531, his interest turned to independent studies. Though for a time staying the course with law, he was increasingly devoting his efforts to Scripture and the writings of the church fathers, particularly Augustine. While in Orleans, he had contact with Pierre Robert, called Olivétan, who was Calvin’s cousin. 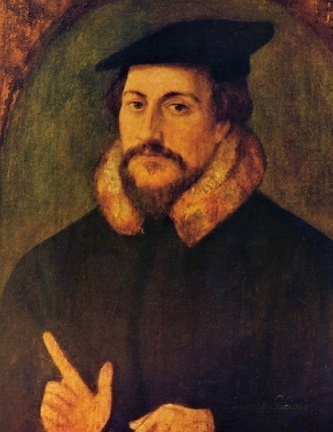 Olivétan influenced Calvin greatly regarding the Reformation. Olivétan himself would in a few years make an important contribution to reform by providing the first ever French translation of the Bible from the original Greek and Hebrew. John was encouraged by his cousin to devote himself to studying the original languages of Scripture, and it is believed that Olivétan was an important instrument used by God for Calvin’s conversion. The exact point in time when Calvin embraced the gospel is not certain, but it is thought to have been sometime around 1532. Many years later Calvin commented in the preface to his Psalms commentary that his conversion had affected his studies. The king of France, Francis I, had ruled since 1515 and Luther’s theses had been posted less than two years into his reign. When Francis died in 1547 he had made many decisions regarding events associated with Protestants. A pivotal event that occurred in France in October 1534 was the Affair of the Placards. Posters attacking the mass and calling it witchcraft were pasted on walls all over Paris as well as other major cities. One was even posted on the door of King Francis’s bedroom. The king had been tolerant towards the Reformation and had even hoped peace could be achieved between Protestants and Catholics, however, the placard incident was seen by him as a personal attack. Francis switched from toleration of Protestants to persecution and repression. Some Protestants were abused, imprisoned, and several were executed as the the Affair of the Placards brought subjugation. Many Protestants fled France for refuge in other realms. John Calvin was one of those that fled to escape persecution and continue his work in a location friendlier to reforming ideas. Calvin and his traveling associate, Louis du Tillet, arrived in Basel, Switzerland early in 1535. Calvin was broke at the time, so the wealth of Louis came in handy for paying expenses. The language of the city was German, which Calvin did not know, so he laid low with other French exiles in town and adopted the name Martinus Lucianus. The solitude was really a golden opportunity for him to learn more about the Bible and write. During the Basel exile he wrote the first edition of Institutes of the Christian Religion and the preface to the French Bible published by Olivétan in 1535. Calvin left Basel for Ferrara, Italy, in the spring of 1536, where he met with some individuals that were interested in reforming the church. One person, the Duchess of Ferrara, Reneé of France, was drawn to Reformation theology but due to her position as a member of the nobility, she tried to maintain the appearance of a faithful Catholic while hoping for reform. Becoming a Protestant was a dangerous decision for anyone, but could be especially so for nobility. After a short time in Italy, Calvin returned to Basel briefly and then went on to Paris. From Paris, he left for Strasbourg but due to troops and conflict in the area, he instead went to Geneva. The city by the lake and its lovely setting would be his home for much of the rest of his life, but not before some trying events. Stay tuned when we conclude John Calvin’s biography in August.